Fruit Stem cells, BioActive 8 Berry complex and lavender gently refresh and stimulate as biotin B-complex nourishes with essential proteins to support strength, texture, and manageability. The result is noticeably thicker, fuller looking hair with greater lift, body and silky shine. Fruit Stem Cells (organic): Improve hair follicle longevity and vitality for healthy hair from root to tip. Biotin B-Complex: infuses essential protein and nutrients to invigorate scalp for thicker, fuller strands with improved strength, texture and shine. 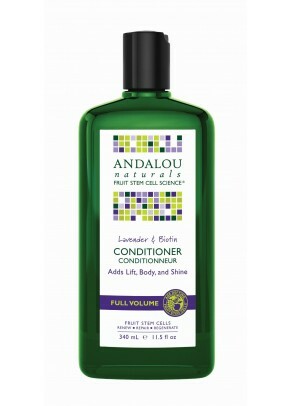 Lavender Oil and Extract (organic): gently refreshes scalp and hair, stimulates and improves circulation. Camelina Oil (organic): nourishing and healing properties repair and protect hair follicles. Cranberry Oil (organic): light, non-greasy moisture balances hydration while portent antioxidants maintain color and shine. This conditioner also contains other moisturizing and nourishing natural and organic ingredients: organic plant oils (sunflower, flax, jojoba, grape seed), organic plant extracts (aloe vera, white tea, hibiscus) and vitamin E. Please see detailed list of ingredients for more information. Apply to clean, wet hair, working from ends up and rinse. Color safe.